The sparkling Twin Lakes - two nearly identical alpine lakes that attract campers, anglers, and nature lovers - are nestled deep in the Deschutes National Forest southwest of Bend. The Twin Lakes are only about 45 miles southwest of Bend. Anglers can fish for salmon and trout. Ice fishing at the lakes is popular in the winter. The lakes are insulated from road noise, foul weather, and strong winds. Two campgrounds near the lakes provide scenic campsites. Close to identical, North and South Twin Lakes are located in the beautiful Deschutes National Forest. Volcanic activity nearly 20,000 years ago formed the two craters that are now filled with the clear alpine waters of Twin Lakes. North Twin Lake is the larger, deeper lake. Both are located at elevations over 4,300 feet. The basins are naturally protected from strong winds, inclement weather, and highway noise. Approximately 45 miles from Bend, Twin Lakes is a popular destination for hiking, camping, snowshoeing, and fishing. 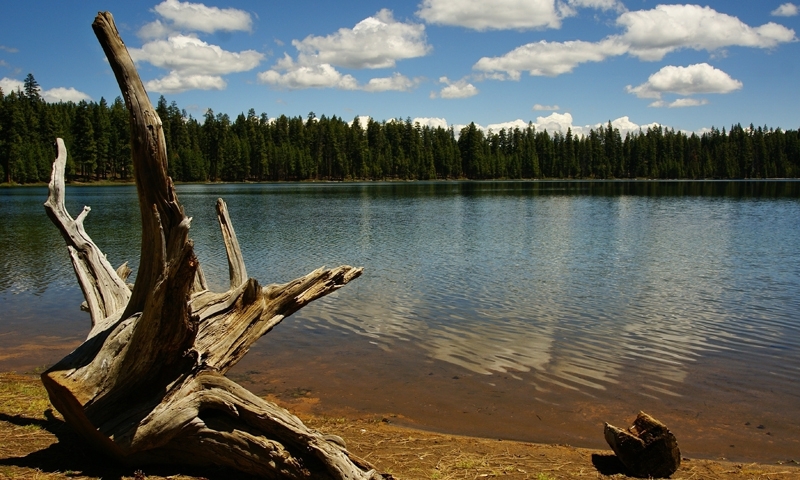 Twin Lakes are approximately 45 miles southwest of Bend. Follow Hwy 97 south to the Fall River turnoff 3 miles past Sunriver (County Route 43). Then take Forest Service Rd. 4260 to Twin Lakes. Fishing – Avid anglers will enjoy fishing in both lakes. South Twin Lake is stocked with rainbow trout; it is not uncommon to catch trout that are 18 inches long. North Twin Lake has Kokanee salmon, brown trout, and rainbow trout. In the winter, ice fishing attracts many anglers. Snowshoeing – The breathtaking back country scenery is perfect for snowshoeing. Visitors are few in the winter, so you can enjoy this remote area without crowds. Camping – The North Twin Lake Campground and South Twin Lake Campground provide beautiful sites to pitch your tent and enjoy the clear, starry nights typical of Central Oregon. North Twin Lakes is 7 feet higher in elevation than South Twin Lake. Its depth ranges from 40 to 60 feet. South Twin Lakes has depths ranging from 33 to 58 feet. North Twin Lake has a surface are of 112 acres; South Twin Lake’s surface area is 99 acres.